Lights of Lobethal Christmas festival has been lighting up the Lobethal Valley in the Adelaide Hills (South Australia) for over sixty years… created by the community of Lobethal. 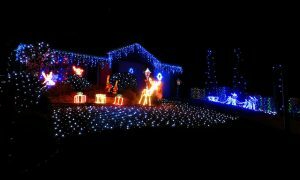 In the true spirit of Christmas, a tradition that has continued for over 60 years began, and has now evolved into the largest Community Christmas Light Display in the Southern Hemisphere. Lobethal lights up on Sunday December 11th, and the Festival continues until Friday December 30th, 2016. Following the official “Lights On” ceremony residents will turn on their lights and these wonderful light displays will remain lit each night until Friday the 30th. Please browse our site to find out more about our festival attractions, events and our town.